Firstbeat makes the benefits of digital physiological modeling available to everyone with near-laboratory accuracy. Over 20 years of experience studying dynamic heartbeat signals transformed into understandable and useful information that matters. Firstbeat’s products and innovations are built on over 20 years of research. Areas of investigation include physiology, psychology and psychophysiology. Scientific publications for professional knowledge and understanding. Our hearts react to the demands of life and environment. Analyzing how the heart is changing from beat to beat unlocks a wealth of information revealing physiological states. Balancing stress with sufficient recovery ensures long-term wellbeing. Revealing these functions with HRV makes better management possible. Firstbeat uses data about respiratory functions coded into HRV data to make highly accurate estimates of energy expenditure expressed in calories. VO2max represents the maximum volume of oxygen the body can consume in one minute. It is easily the most important metric of cardiorespiratory fitness. EPOC is a physiological measurement that reflects the body’s recovery needs after strenuous activity. It can now be effectively predicted using heart beat data collected during physical activity. Firstbeat can non-invasively detect personal anaerobic thresholds using a combination of HR, external workload, and HRV. This can be done during any freely performed exercise. Firstbeat helps avoid the dangers of overtraining by making the effects of training visible and accurately predicting the effects of future training. The heart is our most important muscle for preserving life. Constantly changing, it adapts to our body’s internal and external needs. Examining the details of these changes reveals what happens behind the scenes in our body. Placed in the context of our research and modeling techniques, they form the basis behind Firstbeat Insights. Firstbeat examines the data rich details of the heart’s adjustments to create feedback that helps people reach higher performance goals and improve personal well-being. By this way, the data is turned into rich, valuable, and understandable feedback that helps to perform better, make the correct training and coaching decisions, and to improve wellbeing and health. The magic of converting physiological data into actionable information requires a unique digital model. Firstbeat’s process uses heart rate variability (HRV) data combined with advanced mathematical and signal processing methods to document an individual’s autonomic nervous system regulation. Starting from heartbeat data, the Firstbeat analytic engine computes and creates a digital model of the human body describing key physiological processes such as oxygen consumption, energy expenditure, excess post exercise oxygen consumption (EPOC), as well as stress and recovery reactions. To make this possible, Firstbeat has developed ways of utilizing HRV in real-life conditions, which are not stationary and stable, but rather dynamic and complex. 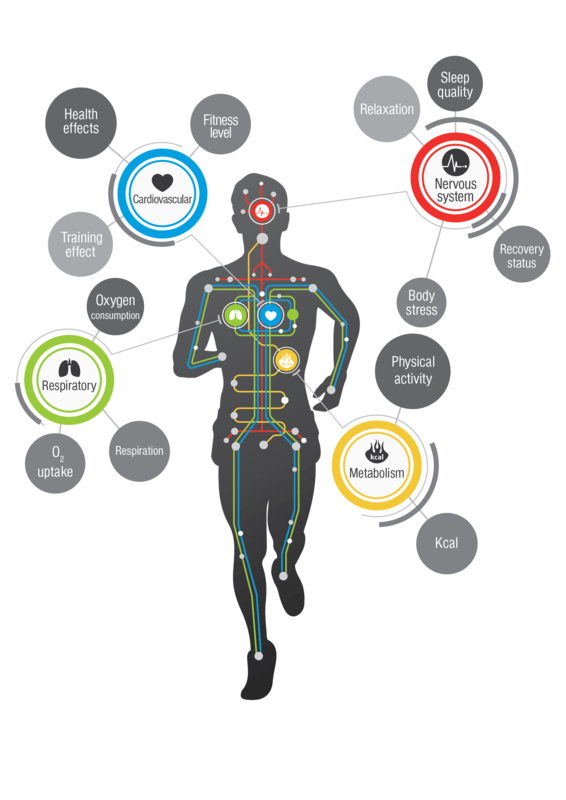 Consequently, Firstbeat is able to provide a comprehensive view over physiological reactions, and to analyze and provide feedback for example on effectiveness of training, recovery status, fitness level as well as lifestyle-related aspects such as stress, recovery, and physical activity.